The sale of land (Lot 3) within Kitchener Park Mona Vale will fund the design and construction of the exceedingly overdue Skate Park! Help us (once again) demonstrate to Pittwater council the obviously overwhelming level of support the construction of this facility has ! The significant health, wellbeing and social benefits a facility like this adds to a community cannot be overlooked. Please Pittwater Council....... approve the sale of land and finally make this long winded dream of many a reality! Please sign this petition and pass it onto others who care for the future of Northern Beaches youth. 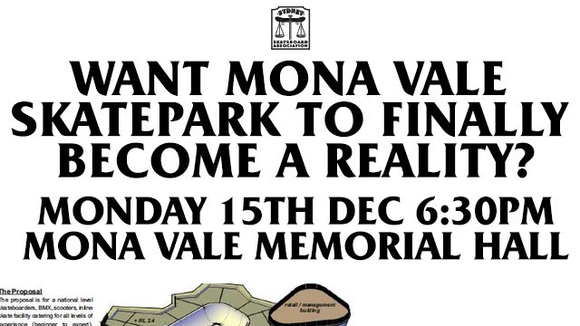 You can also show your support by joining us at Memorial Hall, Mona Vale on December 15th - 6:30pm SHARP ! Thank you. The meeting is going down tonight so any last minute signatures would be great but more importantly get down and show your support! This is the only chance we are gonna get!